Although it can be eaten fresh, traditionally its main use is in the kitchen. The yellow flesh has a spicy flavour, and is notable for its high sugar content (it is sometimes known as Sweet Prune for this reason). The flesh is also drier than many English culinary plums, which means it does not dilute the surrounding pastry or cake mix with excess liquid. In short, this is the ideal variety for making German plum cakes, plum dumplings, and other traditional desserts from central Europe - and a good present for anyone interested in cookery. Please fill in the details below and we will let you know when Haus-Zwetsche plum trees are back in stock. Haus-Zwetsche is in flowering group 4. Haus-Zwetsche is self-fertile and does not need a pollination partner, although fruiting may be improved if there is a compatible tree of a different variety nearby. Haus-zwetsche is easy to grow and is a reliable cropper once it gets established. Zwetsch or Quetsche is the name for a group of small damson-like plums which are found throughout central Europe. 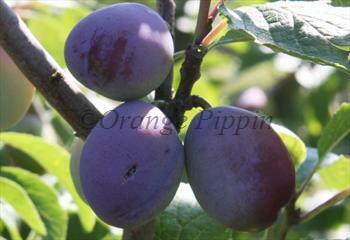 They are known in the UK under various names, including German Prune or Sweet Prune or Quetsche Plum.